What does the average human head weigh? From where in the United Kingdom did the Titanic set off on her maiden voyage? Can you name the manager who took charge of the England football team in 1977? In which year did the United Kingdom first win the Eurovision Song Contest with Sandie Shaw’s ‘Puppet on a String’? 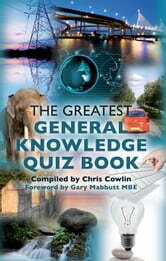 If you can answer these questions and more like them, then The Greatest General Knowledge Quiz Book is for you. You’ll never realise how much you don’t know until you have dipped inside this book and tried to answer the 250 questions, designed to test your knowledge on a broad range of subjects. Packed with fascinating facts, this book aims to be educational as well as fun and is an easy way to learn. So whether you want to test yourself against the kids or broaden your general knowledge in time for the next pub quiz, this book is a must have for all ages.